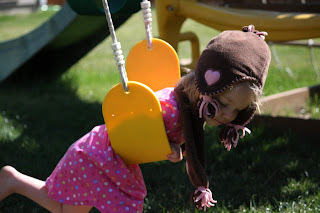 The Corbin Crew: Summer fun! The Coles come over once a week for dinner together and then...after the kids go to bed we have a meeting/prayer time. 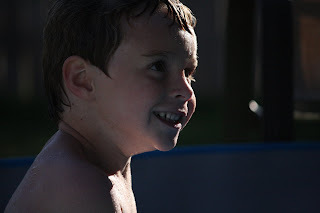 This past week the kids played in the water outside before bed and had lots of fun! 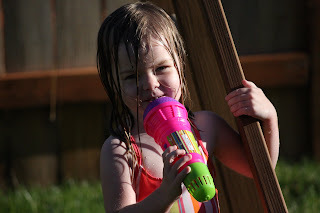 It was one of the first times this summer we had played in the water. It has either been too cold or we have been busy with sports camp or block parties. The kids loved it! 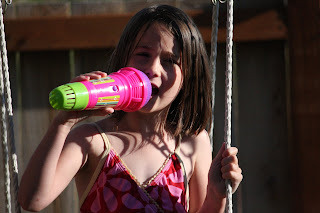 Rylie singing a little tune while she takes a break from the pool! Madison had to sing a little too! For some reason Taitlyn decided it was a little too cool outside so she went in by herself, found her winter gear and put it on...all by herself!!! It was too cute!